Ranganathittu Bird Sanctuary is located 20 kms away from Mysore, close to Srirangapatanam city. Though it is the smallest sanctuary in India, with an area of 0.67 sq.kms, it is an important tourist destination. It comprises of 6 islets of River Kaveri. It was declared as a wildlife sanctuary in 1940. 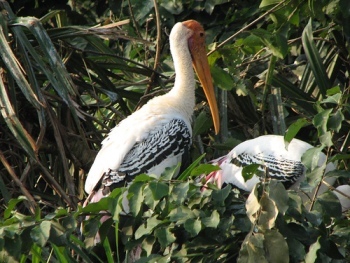 The common inhabits of this sanctuary are water birds like Stock-billed Kingfisher, Indian shag, blackhead ibis, Painted stork and open billed stork. The avian species found here are egrets, cormorants, large flock of streak-throated swallows and herons. Apart from the birds, mammal species like Bonnet Macaque, flying fox, common palm civet, and Indian gray mongoose are also found here. Boat rides are available that take you within touching distance of the birds as marsh crocodiles bask in the sun which is a great excitement. By Air: Mysore is the nearest Airport. By Rail: Mysore Railway station is the nearest railway station. By Road: State Transport Buses, cars, and jeeps. Distance from Bangalore : 128 kms.